Windows Access Panel is a free, moderately useful program that can make it easier for you to change Windows settings that you otherwise wouldn't know how to alter. It doesn't actually give you any tools or access to settings that aren't otherwise available in Windows. Rather, it gives you one-click access to settings that normally require several clicks to reach. Instead of having to navigate your way through the Control Panel, or dig deep into menus, you can quickly get right to the setting you want. Windows Access Panel gives you one-click access to dozens of Windows 7's settings--and Vista's, too. For example, to change your User Account Control settings in Vista or 7, you usually have to go through the Control Panel and click several different screens until you get to the settings themselves. It's easy to get lost along the way. With Windows Access Panel, you can get there with one click. The program offers similar one-click access to dozens of other settings. Want to launch a memory diagnostics tool, schedule a task to run automatically, create a repair disk, or monitor your PC's performance? On your own, you likely won't immediately know how to get to the screens that will let you do those things. With Windows Access Panel, you can get to them right away. If you're comfortable with finding Windows settings on your own, there's no need to download Windows Access Panel. But if you often wish you knew how to navigate to specific settings, you'll find it useful. 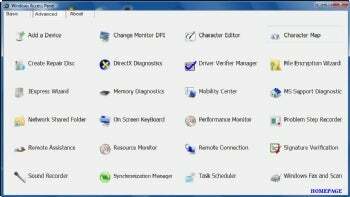 If you're looking to make the jump from Windows XP to Windows 7, it might be a good starting point for finding out the locations of useful settings as well.